Northcote is a residential and industrial suburb 8 km north-east of Melbourne. Until 1994 it was a municipality, bounded on the west by the Merri Creek and on the east by the Darebin Creek. Its northern and southern boundaries adjoined Preston and Fitzroy, Collingwood and Kew respectively. The land surface of Northcote is a mixture of basaltic and mudstone or clay, the latter having a considerable bearing on Northcote's economic development. 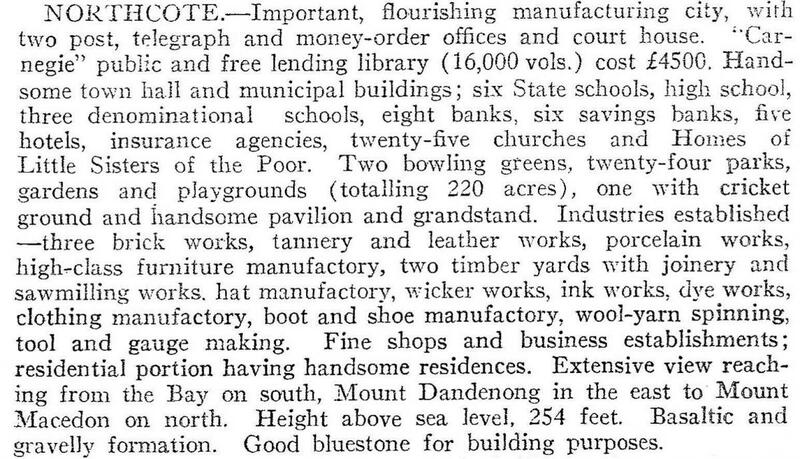 Much of the former Northcote municipality was sold at a Government land sale in October 1839, in lots as large as 115 ha. Two original purchasers have left their names on places or landmarks: Ruckers Hill, west of the Northcote town hall (from William Rucker), and Penders Grove, Thornbury, on the north-eastern border. All the lots were long and narrow, mostly running east-west. Their configuration has imposed the predominant east-west street pattern. 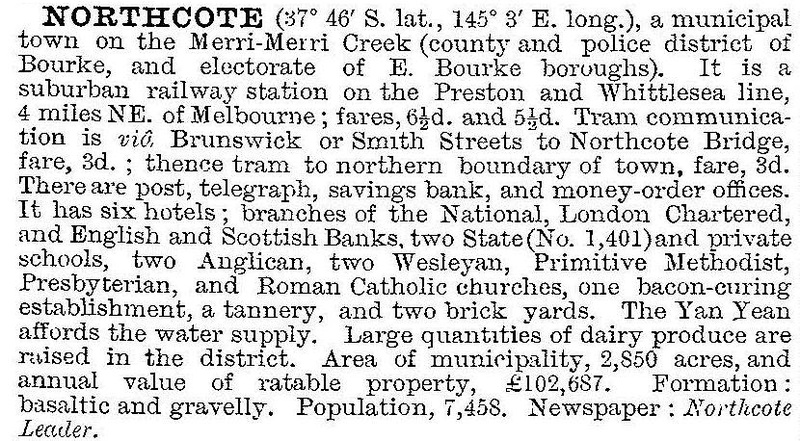 The Northcote township was surveyed in 1853 immediately north of a bend in the Merri Creek where Westgarth is now situated. It is now thought that the name Northcote was bestowed by the Surveyor-General, Sir Andrew Clarke, possibly as a compliment to Stafford Henry Northcote, barrister, private secretary to Gladstone and co-author of the famous Northcote-Trevelyan report on the reform of the British civil service (1853). Whilst the surveyed township nestled beside the creek it was William Rucker's land to the north which attracted the eye. He built a mansion in 1842 in Bayview Street, at the top of Ruckers Hill which slopes down to the Merri Creek. Land sales in 1853-54 after the gold rushes did well, and well-to-do houses were built. High Street was the spine of the district, joined to Melbourne by a bridge (1850) over the Merri Creek. A Wesleyan church and school were opened in High Street between Mitchell and Bastings Streets, their premises functioning as a community centre for several years. The Anglican church was opened in Westgarth, nearer the creek, in 1860, along with a school. The Peacock hotel was opened just south of the Wesleyan church in 1854, along with the Shannon to the north of the church. One of Northcote's better known thoroughfares is the west to east Separation Street. It is a narrow street made by a land subdivider wanting as much profit as possible, and naming it soon after Victoria's separation from New South Wales in 1851. A number of German settlers bought land along Separation Street (also known as German Lane) and their German cemetery is at 141 Separation Street. Until the land-boom 1880s, Northcote remained rural, with occasional mansions or large homes. It was beyond the ring of metropolitan development before the land boom. Notable establishments along the river valleys were the Fulham Grange Orchard and preserving factory, Lucerne Farm and the Yarra Bend metropolitan lunatic asylum (1848). 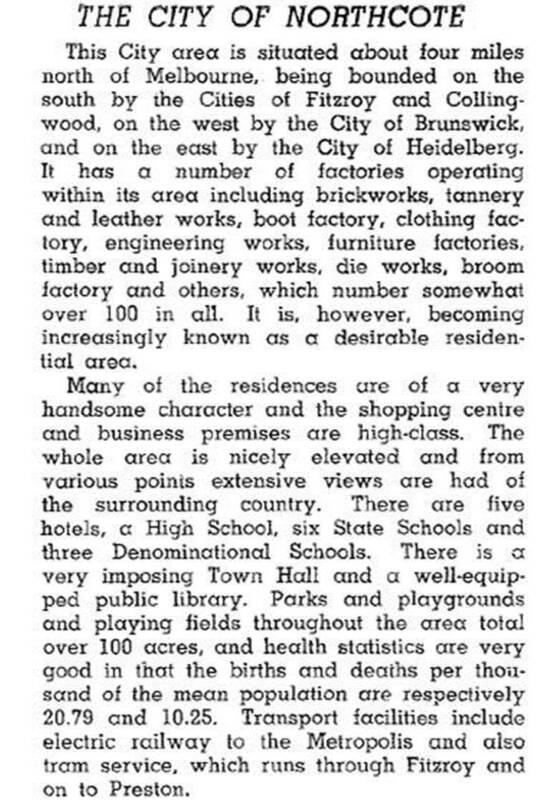 Industries began in the 1870s, including slaughtering yards, piggeries and claypits. (For a while the area around the Wesleyan church was called Newmarket, possibly a reference to butchers and associated activities.) An early claypit was operated by the Patent Brick Co east of the corner of High and Separation Streets (1873). It was the forerunner of the Northcote Patent Brick Co Ltd (1886) with three Hoffman kilns. Finally becoming the Northcote tip, the former quarry sites are now occupied by the Northcote Plaza shopping centre and Kmart. In 1874 the State school in Helen Street was opened, replacing the Wesleyan and Anglican schools. 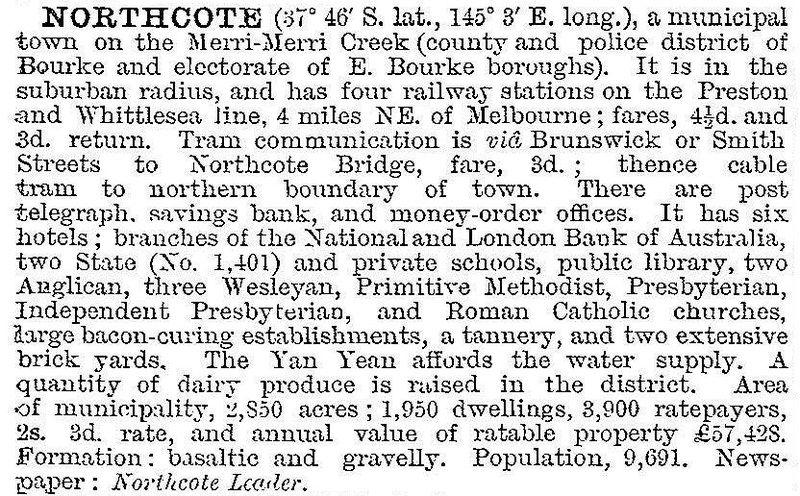 On 25 May 1883, Northcote became a borough. Before then it had been part of Jika Jika shire in union with Preston, which in turn had been part of a larger Darebin shire (1870) and Epping Road District (1864). Northcote borough progressed to a town in 1890 and a city in 1914. The town hall (1881) in High Street is part of a commanding public buildings precinct at the top of Ruckers Hill. Other buildings include the former police office and police court (1888), the free and public library (1911), Catholic church (1891) and former Presbyterian church (1894). When the land boom came Northcote was effectively without any public transport. The railway had no direct connecting corridor to central Melbourne, having to rely on a circular route from Spencer Street via Flemington, Carlton North and Fitzroy North, which linked to the Heidelberg line (1888), but not to a line through Northcote until 1891. The direct connection to central Melbourne through Clifton Hill and Richmond came in 1901-03. Even trams were late coming, the High Street cable tram opening in 1890 under the aegis of the Clifton Hill to Northcote and Preston Tram Co. Its promoter was George Clauscen, German-born, Fitzroy mayor 1886-87, chain-retailer of furniture and sometime Northcote councillor. By then High Street had a substantial commercial strip with 70 business premises between the town hall and the Carters Arms hotel and Separation Street next to the brickworks. Another State school had opened in Wales Street in 1891 and the Little Sisters of the Poor opened the first of three buildings on the spacious grounds they had acquired in St Georges Road. The borough was proclaimed a town on 12 September 1890, the year the new town hall was completed. During the 1890s Northcote's population stagnated at about 7000, in the next decade it nearly doubled and in the 1920s it did the same again. At last Northcote and a direct-railway link had been discovered. In 1898 the Northcote Football Club was revived, and played its home matches at Northcote Park from 1904. Pony racing was begun at a racecourse off St Georges Road between the Croxton and Thornbury railway stations on a site oddly called the Fitzroy racecourse, one of the three owned by John Wren (the others being at Ascot Vale and Richmond). High Street saw the opening of the Northcote Picture Theatre in 1912, one of Australia's earliest in terms of its size and ornamentation. Southwards, near the town hall, a free library was opened in 1911, funded by the American millionaire, Andrew Carnegie. Northcote town was proclaimed a city on 13 March 1914. In 1907 an argumentative fruit picker for the Goulburn Valley began hawking fruit and rabbits in Northcote, and opened a fruit shop in High Street in 1911. He joined the Labor Party, was elected to the Northcote council in 1915 and entered the State Parliament's lower house as the district's representative two years later. John Cain became Premier of Victoria in 1943, 1945-47 and 1953-55. In 1920 Northcote got a third north-south public transport route, the tram along St Georges Road. Residential settlement spread east and west of the tram lines, and several churches were built. Northcote high school was opened in 1926. The football club won its first premiership in the Victorian Football Association in 1929, with its star Aboriginal player Douglas Nichols. Nichols later played for Fitzroy, returned to Northcote, became a Church of Christ pastor, activist in the Aborigines Advancement League and Governor of South Australia in 1976. Within a decade Northcote was in the midst of profound change. Italian migrants settled in Northcote (9.5% of the municipality's population was Italian born in 1961), along with other nationalities. In people's minds Northcote was becoming joined with neighbouring Collingwood as an inner suburb. Verandah posts, trees and old buildings became a nuisance to progress. The Anglican church, which had been built on the site of Ruckers mansion in 1926, was sold to the Eastern Orthodox church in 1966. Besides having overseas-born residents, Northcote's school-age population began to fall in the 1960s. The Italian and Greek communities began to challenge the Labor party's Anglo-Celtic membership. A further sign of change was when the New Northcote Brick Co sold its quarry to the council for a tip. The Northcote Plaza was opened on the unquarried land in 1981 and expanded when the tip was filled. With an area of 14,000 sq metres (Kmart and 41 shops), it drew passing trade from the once dominant High Street which succumbed to non-retail uses and vacancies. All Nations Park adjoins the shopping area and a Catholic girls' college (1904). By the 1980s the spread of gentrification crossed the Merri Creek from Fitzroy North. The local brickworks had bestowed a solid terra cotta building stock. Northcote's median house price in 1987 was 93% of the median for metropolitan Melbourne and in 1996 it was 116% of the metropolitan median. Many houses are double-fronted, or weatherboard California bungalows. There are also row houses and flats, amounting to 40.2% of dwellings (2011 census). The Northcote municipality contained Croxton, Dennis, Merri and Thornbury, and, after 1 October 1962, when part of Heidelberg city was annexed, Alphington and Fairfield. On 22 June 1994, most of Northcote city was united with Preston city and a small part of Coburg city to form Darebin city. A fascinating collection of 3000 photographs by David Wadelton, taken when he was an art student in 1975, depict migrants and workers in an industrial Northcote in the 1970s.